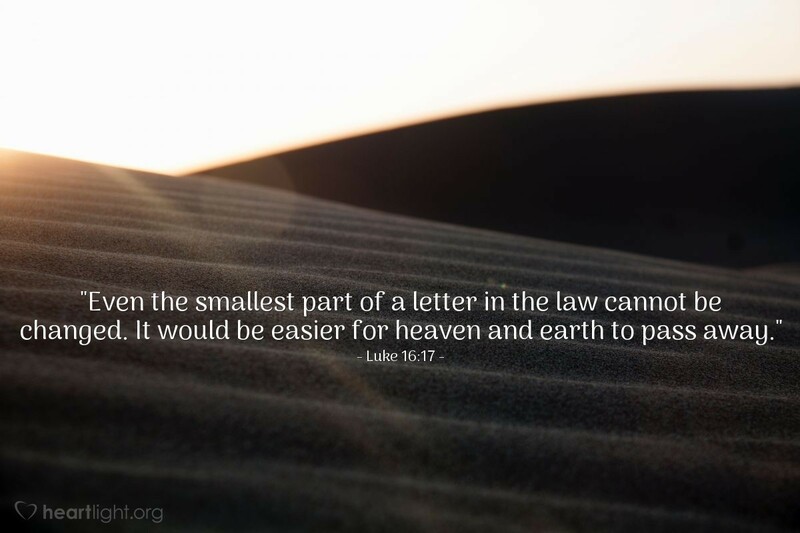 "Even the smallest part of a letter in the law cannot be changed. It would be easier for heaven and earth to pass away." The intent of God's Law was to form a holy people who reflected the character of the holy God they worshiped. Jesus' goal was not to abolish the character and call of the Law, but to make it more real, permanent, and transforming in the lives of the people of God. What flawed humans couldn't do through the Law, God did through his Son and the Good News of the Kingdom that proclaimed his work. More than fulfilling the purposes of the Law, the Good News of the Kingdom made it stronger and more permanent. Grace does not just liberate us from law; it liberates us to the character the Law sought to define and command in us. Father, I ask that your holy character and that your perfect will be displayed in what I say, how I live, and what I desire in my heart. In Jesus' name. Amen.